The club, which provides soccer training for over one hundred local children, had decided to perform a 'clean-up' of their pitch in order to make it safer to play on. Charles Gould, the Technical Director of the club was on hand with his coaching staff to ensure that everything ran smoothly and he was impressed by the attitude of his players. 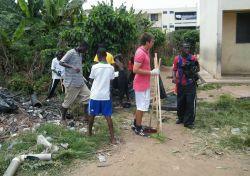 "Obviously they would rather be kicking a ball around," he said, "but it's been great to see everyone lending a hand." When asked about the reasons for the project, he replied "You only have to look at the pitch to see stones, bottles and other litter that makes it potentially hazardous. Thankfully, some of our volunteers raised money to buy shovels, gloves and other equipment that we can use to clean the pitch and make it safe and enjoyable for the kids to use." By the end of a long day much of the debris had been cleared from the pitch and everyone gathered together to take refreshments and a well-earned rest. Let’s hope that all their hard work made a difference and wish them luck for the coming season!